“It appears to be just a handful of credible entrants” said Apple CEO Steve Jobs on iPad rivals, “not exactly an avalanche.” It’s certainly been a shaky few weeks for tablets in general; while Apple’s slate can apparently do little wrong, contributing nicely to another record financial quarter for the Cupertino company, the rest of the market is looking deeply troubled. Qualms over platforms, sizes, pricing and usability have all come to a head over the past seven days, leaving manufacturers looking almost as confused as the would-be consumers. Jobs laid into Android as a “fragmented” platform and 7-inch displays as “too big to compete with a smartphone, and too small to compete with an iPad.” Nonetheless, Android appears to be the horse on which most Apple rivals are betting. Reviews of the first new batch of Windows 7 slates proved less than positive, with models like the Tega v2 criticized for shortfalls in usability. While Microsoft’s latest version is certainly stronger than Windows XP Tablet Edition ever was, gauged against finger-centric platforms like iOS and Android it lacks the immediacy and intuitiveness users have come to expect. In response, we’ve seen a gradual distancing of manufacturers from Windows 7, fleshing out vague rumors of reluctance over Wintel slates reported for the past few months among OEMs. MSI has apparently frozen its Windows 7 tablet development, and Lenovo has dismissed the platform as too tied to the keyboard/mouse paradigm as to be suited to pure slates. The question now is not so much whether Android, but which Android, and that’s a thick vein of confusion which even Google itself seems mired in. “What does it mean when your software supplier says not to use their software in your tablet?” Jobs asked, referring to Google’s apparent guidance to manufacturers to wait until at least the next Gingerbread release of Android for tablet use. The first Gingerbread models are expected to arrive at CES 2011 next January – including the new Android model that MSI is supposedly focusing on in favor of Windows 7 – but other manufacturers are even more wary. Lenovo, while eschewing Microsoft’s OS, has said it intends to wait until Honeycomb, the version of Android beyond Gingerbread, before making its play. On the flip side, Android 2.2 Froyo models are reaching store shelves now, or are expected to in the next few weeks. Samsung’s Galaxy Tab is perhaps the best known, already on sale in some mainland European markets and hitting the UK on November 1st and the US through that month. As well as being one of the 7-inch models Jobs was so eager to dismiss, the Galaxy Tab has found itself mired in controversy over the apparent premium price Samsung – and its carrier distributors – is charging. In the UK, pre-orders have currently settled at around £530 ($830), the same local price as a 16GB iPad WiFi + 3G; in the US, meanwhile, Verizon has been the only network to announce solid numbers, prompting an outbreak of surprise by asking $599.99 for the unsubsidized slate. Leaked figures from T-Mobile USA, meanwhile, have previously suggested the GSM carrier will be offering the Galaxy Tab at $399 with a two-year data plan, still an expensive option. It seems a risky strategy on Samsung’s part (though carriers set the final subsidized numbers, they’re obviously dependent on the manufacturer’s RRP and wholesale cost), when many had hoped they would significantly undercut the iPad in an attempt to secure market share (and for what is a significantly smaller device). What must be remembered is that Samsung doesn’t intend to echo Apple’s market approach: a single model with what will probably be a yearly refresh cycle. 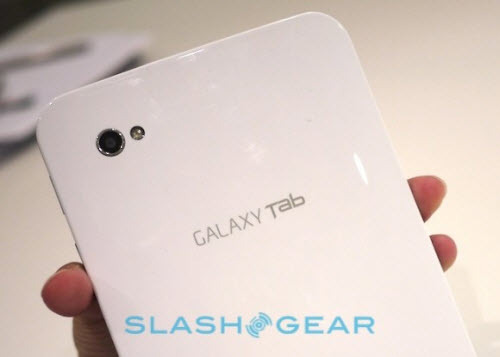 Instead, as we’ve seen with their Galaxy S family of Android smartphones, the company is planning numerous more Galaxy Tab family slates, both with smaller and larger touchscreens than the 7-inch original. The likelihood is that we can expect the middle-ground between 4-inch Galaxy S and 7-inch Galaxy Tab to also occupy the middle-ground in pricing, to avoid stepping on the toes of either. Samsung’s play is to capitalize on the inherently niche nature of tablets, offering more targeted models built around a core platform and, presumably, hoping the combined sales are enough to sustain the project. At the other end of the scale there are cheaper slates such as the Advent Vega, a 10-inch Tegra 2 based Froyo tablet headed to the UK market at the start of November, and priced at a mere £250 ($390). In return there’s a barely tweaked version of Android, rather than the custom apps Samsung has worked on, and the assumption that the target audience will prioritize affordability above all else. The company tells us they’re looking to put Gingerbread on the slate when it becomes available, potentially making the Vega both a cost-effective and functional option, though we’ll need to wait until the reviews filter through before knowing for sure. Android isn’t the only platform; RIM has been gradually drip-feeding us with more information on their BlackBerry PlayBook tablet, expected to reach the market in early 2011. Earlier this week the Canadian company confirmed they would be matching the iPad’s 16GB, 32GB and 64GB SKUs, while co-CEO Jim Basillie took time to rail against Steve Jobs’ tablet commentary. 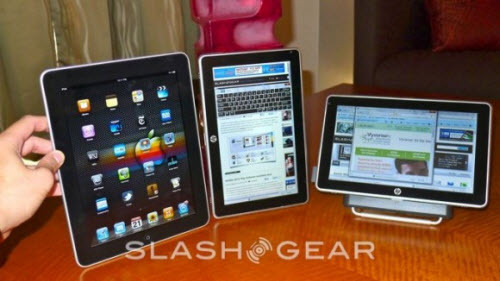 “7-inch tablets will actually be a big portion of the market” he insisted, suggesting that was common knowledge “for those of us who live outside of Apple’s distortion field.” Still, the PlayBook will likely reach the market around the time Apple’s second-gen iPad does, something we can guess will answer most of the criticisms of the first model while at the same time biting away at the BlackBerry slate’s impressive feature set. RIM’s play will be the enterprise market so traditionally enamored with their smartphone line though, as we’ve seen with the iPhone, Apple has proved itself adept at taking an initially consumer-focused device and adding enterprise functionality. Anecdotal evidence has already suggested that business users are eyeing the iPad and finding ways to integrate it into their workday, leaving Cupertino a primed audience. There are, of course, a few outliers. The HP Slate 500, for instance, finally made its official debut this week, stubbornly sticking with Windows 7 (HP’s webOS slates aren’t expected until 2011). The company has refined its targeting for the 8.9-inch tablet, no longer positioning it as a device for everyone but instead playing on its corporate skills. There’s also a significant advantage in its touchscreen technology, pairing the capacitive touch layer which the iPhone/iPad has made popular with an active digitizer for more precise stylus use. As we know from previous Windows 7 tablets, it’s something business users come to expect as well as something which significantly improves the OS experience. HP’s pricing is also strong – $799 including a desktop dock – perhaps not in comparison with consumer models, but against other Windows 7 slates (like Onkyo’s three model range, now available in the US via importers) and convertible notebooks with hybrid touchscreen displays. As ever, the target is vertical markets like healthcare, though HP will need to prove the Slate 500′s battery life first and then convince corporations that consistency in platforms is worthwhile. Sharp, meanwhile, has taken a more unusual step and abandoned its traditional PC business in favor of chasing the tablet ereader market with its Galapagos range, though beyond talk of a carrier partnership with Verizon the US details are still scarce. Barnes & Noble are tipped to be augmenting their NOOK range of ereaders with a low-cost tablet – believed to be around the $249 mark – again predominantly focused on ebooks but with the addition of internet browsing. Both companies have turned to Android for the OS. With his reputation for guiding the tech industry by Apple’s example, it’s easy to overlook that Steve Jobs is preaching one single vision of how tablet computing might pan out. To assume that his sole justification for bypassing 7-inch or similar models is usability, however, is naive. His job is to sell users on the Apple/iOS/iTunes/App Store ecosystem, and to put into place the best range of high-profile devices to suit; keeping that range tightly focused is in the best interest of the Cupertino company’s cachet. 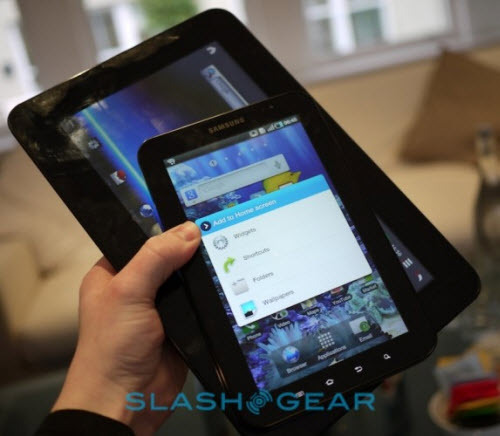 That needn’t mean another company shouldn’t carve its own niche; 7-inch slates have portability benefits, for instance, while Android’s arguably fragmentary nature – as evidenced by the variety of approaches manufacturers have taken with it – could potentially be reframed as a positive sign of the OS’ flexibility. Unfortunately, with manufacturer confusion seemingly at an all-time high, it’s unsurprising that consumers are similarly bewildered by the products they see hitting the market today and in tomorrow’s pipeline. How to extract audio from F4V?